This regular column contains information about the latest updates to ArcGIS Online including new content contributed by Esri and the user community. The Light Gray Canvas Map is a perfect alternative to traditional basemaps, which can have an abundance of detail that obscures data overlays. Any existing map backdrop can be changed to the Light Gray Canvas Map for a cleaner, less cluttered presentation of operational or custom data. The latest addition to the ArcGIS Online basemap collection is the Light Gray Canvas Map, available at arcgis.com and ArcGIS Explorer Online. The Light Gray Canvas Map features an overall soft gray color for land and darker gray for oceans and other bodies of water. 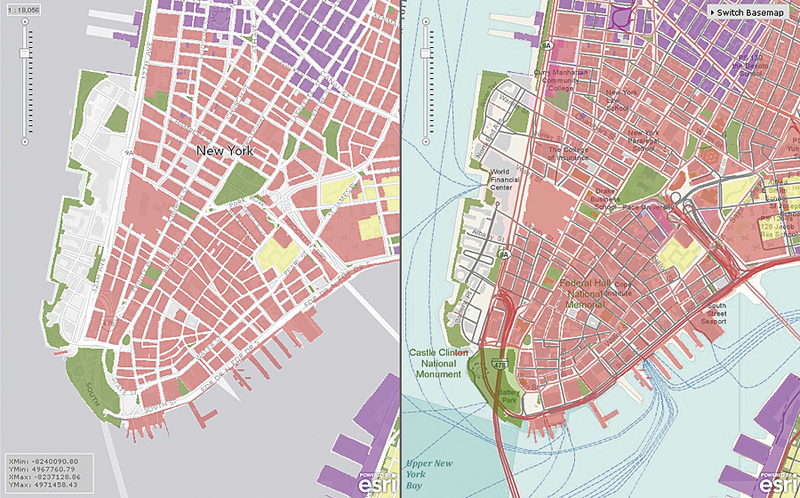 These shades provide a pleasing neutral background so that data overlays contrast sharply with the rest of the map. 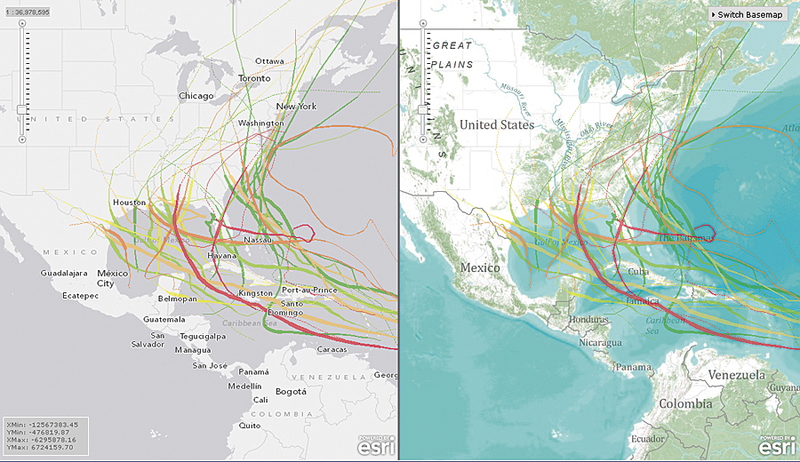 With fewer features and labels on the map, there is more freedom to color and label data. The map is a perfect alternative to traditional basemaps, which can have an abundance of detail that obscures data overlays. Any existing map backdrop can be changed to the Light Gray Canvas Map for a cleaner, less cluttered presentation of your operational or custom data. This new basemap and the recently released Ocean Basemap have been added to the basemap gallery picker in the arcgis.com map viewer and ArcGIS Explorer Online. The latest contributions to the World Topographic Map include new content for Great Britain, Ghana, Spain, and the Netherlands, as well as several areas in Canada—Cape Breton, Nova Scotia, and Gatineau, Quebec—and the United States. Content was updated and expanded for Greece and some areas in the United States, including Delaware County, Ohio, and Washington, D.C. Data from Esri Partners DeLorme and NAVTEQ has been added, as well, for several areas around the globe, including North America, Australia, New Zealand, and southern Africa. The same data from DeLorme and NAVTEQ has also been added to the World Street Map. Data for Great Britain, Spain, and the Netherlands has been contributed through the Community Maps Program. 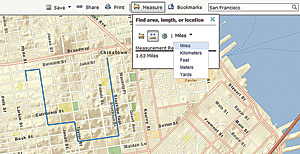 Measure distance or areas or get coordinates with one click. The World Topographic Map and World Street Map and associated reference layers have been updated with the latest available NAVTEQ data for North America and Europe. The map update also includes additional levels of detail, globally down to 1:72,000, and for areas where large-scale data is available, for example, North America, South America, Europe, and the United States nationwide, down to 1:4,000. For metro areas, these maps go down to 1:1,000. More recent and detailed imagery for the United States has been added to the World Imagery Map for several metropolitan areas and states. The World Imagery Map is one of three Community Maps, along with the World Topographic Map and World Street Map. 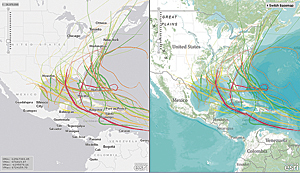 Esri maintains and expands the level of detail of these maps through contributions of GIS organizations around the world. The World Topographic Map is updated on a monthly basis. 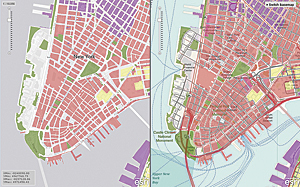 The World Street Map and World Imagery Map are updated at least twice annually. For a complete list of all Community Maps updates and more details, visit the Community Maps Resource Center. The ArcGIS Online World Geocoding Service address locators now use data from NAVTEQ. The European Address Locator has been updated with NAVTEQ Q1 2011 reference data, and the North American Address Locator has been updated with NAVTEQ Q4 2010 reference data. Both locators can be used to perform single address, reverse, and batch geocoding to find and display an address on a map. The World Routing Service now also uses NAVTEQ data. European Routing has been updated with NAVTEQ Q1 2011 reference data, and North American Routing has been updated with NAVTEQ Q4 2010 reference data. Both routing services aid the creation of street-level multistep and optimized routes between two or more points to display, along with driving directions. With the Light Gray Canvas Map, you can create visually compelling maps that highlight patterns. Set the transparency to bring layers to the forefront. 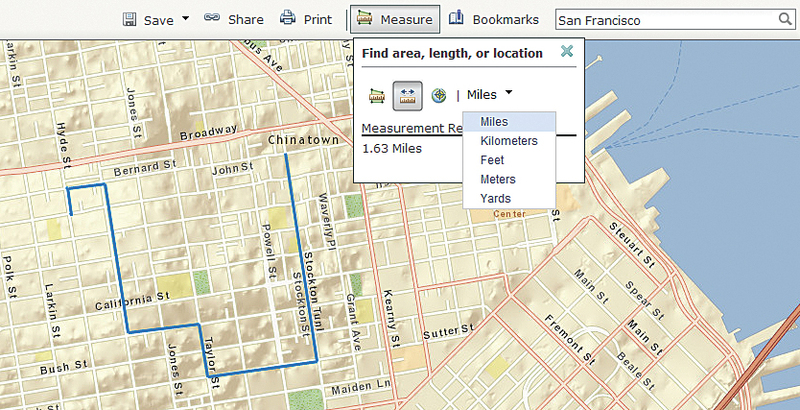 A number of enhancements have been added to the map viewer on arcgis.com. A measuring tool has been added to make it easy to determine the length of a line, the areas of a polygon, or the coordinates of a point on a map. Support for bookmarks has been added for quick navigation. Users can now set the transparency of a basemap through layer properties. This will tone down basemaps and bring out the other layers. This can be done directly from within the map viewer by pausing the mouse pointer over a basemap name in the map contents window. Learn more about recent updates to ArcGIS Online. To start using ArcGIS Online content and capabilities, visit arcgis.com. See also "Access ArcGIS Online in 10 Different Languages."